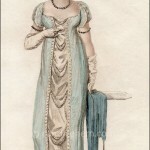 Fashions of London and Paris, February 1804. We all wish she has made an attempt to describe it! 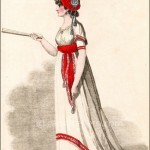 But I would like to suggest that it may have been something like the turban in this print, called in the text a “Mamaluk turban.” Though Jane Austen does not use the term turban, we do know that head-dresses made of fabric, with no straw or other stiffening, we generally called caps. So perhaps Jane’s cap was of a turban-like style. Many fashion prints of this period include Mamaluk (variously spelled) cloaks and robes and other accessories. 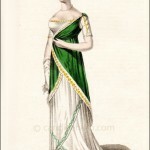 After Nelson’s great victory over Napoleon at the Battle of the Nile at Aboukir Bay in 1798, many fashion trends suggested an Egyptian or Middle Eastern style. These styles, or at least their exotic names, continued for 6-7 years after the battle. “Fig. 1.–A Turkish robe of fine, plain, or worked muslin; turban sleeves. A Mamaluk turban, ornamented with beads, and a white ostrich feather. White shoes.